Note: Class 4, a fall may be fatal. This is the back way to the peak, which has been described as the easiest way for hikers. It is also the shortest. Follow the old road heading toward Sycamore Reservoir. You will follow this road for .8 mile ntil you reach a saddle. At this point the road continues, but the way is barred because they are trying to revegetate the road. A trail parallels the road and advertises the way to sycamore reservoir. Follow the trail into the valley for 1 mile until you get to a trail intersection. There is an old sign that points the way you came and says "Parking 1 mile". Do not follow the trail to the left, it heads to Sycamore Reservoir dam which is about 100 feet down the trail. If you do follow this path, just turn around and go the other way. Instead, take the right fork and follow it along the creek bottom for about .6 mile until you see a fork to the left marked by a big cairn in the middle of the trail. This is a short cut to Bear Canyon trail. If you miss it, you will come to another signed fork in the trail in .5 mile. Follow the signage towards Bear Canyon. 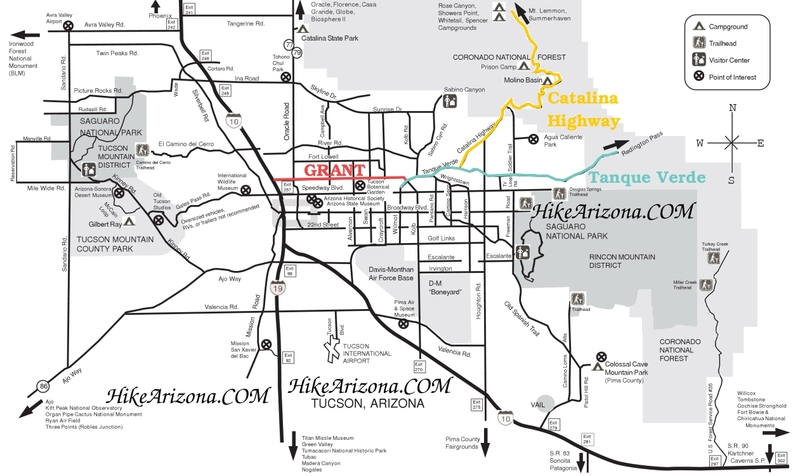 The shortcut will rise out of the valley and meet up with the Bear Canyon trail in .6 mile. Note where the shortcut comes out on the trail so as to not miss it on the way home. Follow the Bear Canyon trail for about 3/4 to 1 mile until you get to Thimble Flat. This is easy to tell, because it is a flat grassy meadow with a good view of Bear Canyon and of Thimble Peak. At Thimble Flat, a cairned trail forks to the right. Take this trail. This trail will eventually lead to the edge of a precipice and peter out, but pay close attention because there is a small cairn in the grass and a faint trail forking to the right after about 100 feet of being on this trail. Take this new cairned trail and follow it all the way to the base of the rock that is Thimble Peak. The trail is faint and follows the edge of a deep gulley until it finally rises to climb the final hill beneath Thimble Peak. There are two summits, the north and south peaks, separated by a large chimney like gulley. The north peak can be fourth-classed up a gulley with a couple hard moves for non-rock-climbers. But this peak is 10 ft lower than the other. The south peak can be climbed by scrambling to the west side and up the chimney-like gulley. Again, there are a couple of hard moves required. Once you get up as far as you can go without seriously thinking of dying, there will be a 10 foot orange slightly overhanging wall on your right with a bolt in the middle of it. To the right is an arete with a small triangular shaped ledge one can traverse to. The best option is to come with a rope and meager rack and climb straight up the orange wall. Up above there is one rappel bolt to get back down. Apparently some folks traverse to the ledge and into a deep crack and then up. This way is really exposed and I don't recommend doing it without a helmet, rope, and protection. Return the same way and enjoy your climb to Thimble Peak! From Tucson take the Catalina Highway up into the mountains. Right around milepost 8 is the signed lefthand turn off for the Gordon Hirabiyashi Campground. Take a left here and drive through the campsites to the end of a smooth gravel road. There is a small roundabout with multiple parking spots for dayhikers.